The ability to create long clear spans, as well as its speed of construction, are some of the reasons why steelwork is the ideal framing solution for car showrooms. Steel tonnage: 800tSteel construction has proven to be the correct framing solution for the Williams Group’s £41M flagship retail centre for BMW, MINI, Land Rover and Jaguar vehicles. The high-profile location of the showroom, adjacent to the Trafford Centre, Manchester, was selected by the company because it met its exacting requirements for a prominent site which it says will set new standards in vehicle retail and service. Situated on a 14.3-acre plot, formerly occupied by a container base, the project includes three steel-framed showrooms and associated workshop structures, as well as a large steel-framed car wash building. Main contractor Caddick Construction started on site last June and is due to complete in June 2019. Once on site, Caddick’s initial task was to demolish a few small office buildings and then undertake a ground improvement programme. The entire site was covered with a concrete slab, which was deemed to be unsuitable for the new construction. It was dug up in the areas where new structures were to be built, and the ground was then vibro-compacted. However, much of the slab has been retained in areas which will be given over to exterior parking lots within the new scheme. Pad foundations were also installed in readiness for the steelwork. Border Steelwork Structures (BSS) began its programme in August and the majority of the steel erection was completed during October. 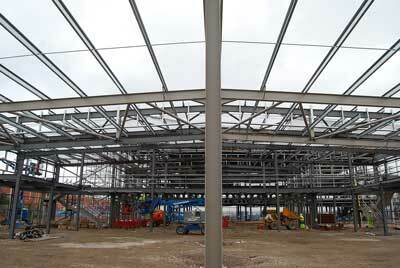 BSS has since remained on site as it is also contracted to install the project’s wall and roof cladding systems. The main buildings include a striking three-storey contemporary glass-fronted showroom for the Group’s BMW marque, which is located at the northern end of the site. The three-storey structure is constructed in a traditional beam and column method with the steelwork supporting metal decked flooring. The structure features a constant 6m x 8m grid pattern, with cross bracing giving the frame its stability. All three of the floors will have display areas for BMW cars, so the front elevation is fully glazed for maximum impact. The floorplates also accommodate office space and meeting rooms towards the rear. Composite Profiles were contracted to detail, supply and install the composite metal floor decking for the upper floors in the showrooms. In total, over 4,100m² of ComFlor E60 and ComFlor 51+ in various gauges, together with perimeter edge shutter and over 12,000 shear studs, were supplied and installed by the company. 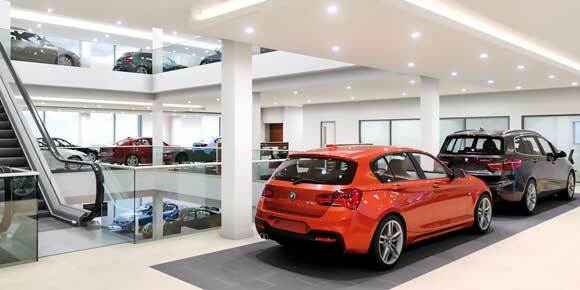 Adjoining the BMW showroom and continuing the overall building’s glazed front elevation is a lower MINI showroom. This is a single-storey portal frame structure, which also contains a small two-storey element for plant. Another, much larger, propped portal-frame is attached to the rear of the BMW showroom. Featuring two 20m-long spans, this structure will house the BMW and MINI workshops. The other main steel-framed structure is the single-storey Jaguar Land Rover (JLR) showroom which is to the south of the site, but also overlooking Barton Dock Road. This showroom’s design is based around JLR’s recently implemented ARCH concept, featuring an 18-car dual-branded showroom together with a service drive-through. The creation and implementation of the dual-brand ARCH corporate identity is said to have been driven by Jaguar Land Rover’s significant growth in recent years. ARCH dual-brand showrooms are all decorated in colours which are said to be unique to Jaguar Land Rover – sunshine grey and champagne silver. The showroom façades are designed in such a way as to frame the product line of each marque within extensive glazed areas, creating what has been described as a ‘jewel box’ effect. As the customer enters any ARCH showroom they are met with an interior environment that, like the exterior of the building, expresses the modernity of Jaguar Land Rover’s current design philosophy. A single reception area serves both the Jaguar and Land Rover brands and customers wishing to inspect the product lines will head left or right to see the two distinct vehicle ranges. This dual-brand configuration in the showroom is formed with a propped portal frame that has two 21m-wide spans, creating a space for each marque. A double row of central prop columns forms a 2m-wide corridor that separates the two showrooms. “We have worked on the designs for a number of showrooms and steel is the best framing solution because of the large amount of glazing and extensive open-plan space they usually incorporate,” says RPS Project Engineer Conor Stratton. To the rear of the JLR showroom a link structure connects into the workshop area, which is another large propped portal frame with two 21m-wide spans. The final piece of the steelwork programme involved BSS erecting a further portal frame to house wash bays and valeting areas. In keeping with the site’s bespoke design, this is no ordinary car wash facility as it is 78m-long and 30m-wide, housing four lines of wash bays in a wet zone, which is accommodated in one half of the building, with valeting occupying the dry half of the structure. Summing up, Williams Group Managing Director Nick Cook says: “We operate one of the largest family groups of premium and luxury automotive retail centres in the country and continually invest and improve our business to benefit our staff and customers.